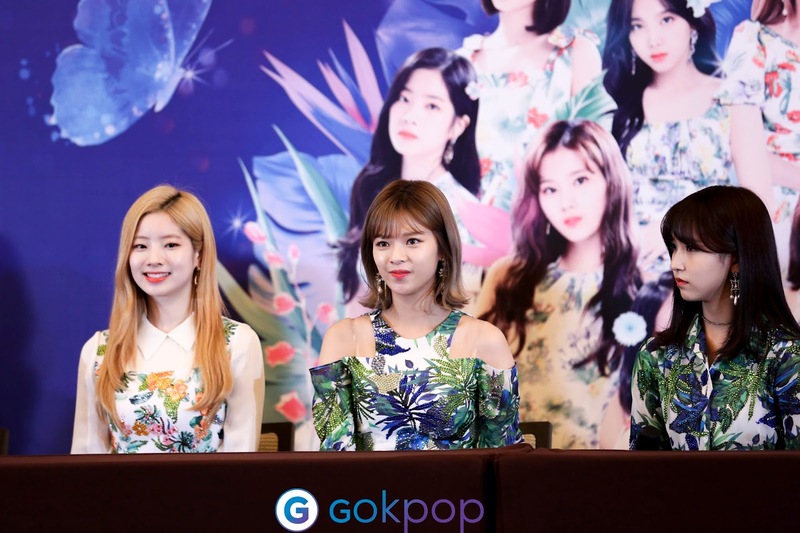 Prior to TWICE's second concert in Singapore, they held a press conference on 16 June 2018. The 9-members girl group pulled off a beach look with floral dresses, without doubt, they looked absolutely stunning. The press conference started with a question on their feelings upon returning to Singapore for their second time. TWICE expressed their thankfulness for the opportunity given to meet ONCEs again within a year for their second concert. The top-charting girl group managed to mesmerisee a larger amount of fans this time round as the concert's venue held this year is twice as bigger. Chaeyoung mentioned that this year's concert consists of an array of new songs, including unit performances. Fans should definitely look forward to it. ONCEs must be curious on why the concert is named "Fantasy Park", in regards to that, Sana explained that fantasy park is similar to a theme park filled with exciting rides to enjoy with friends. Similarly, she wants fans to enjoy the concert as much as they do in a theme park. Who can resist Singapore's local cuisines especially the famous chili crab? MoMo said it with excitement she loved the chili crab and Sana added in that the steamed buns dipped in chili crab's sauce is enticing. We hope that the girls will be able to try other local cuisines too! With a long setlist, each of them definitely has their favorite one. MoMo chose 'TT' as her favorite because they garnered attention because of the song with easy dance moves to follow. Jihyo instead chose 'What Is Love' as it relates to our daily life. They revealed that during the filming of 'What Is Love', it seems that the members had a memorable episode. They got to cross-dressed which they finds it really intriguing! Skin-care routine is essential for every idol especially when they have to put thick makeup for long hours. Dahyun recommends mask packs and aloe vera cream to protect her skin from drying. On the other hand, MoMo brings snacks instead to keep herself awake whereas Jeongyeon will bring headset to smooth her ears. We would like to thank One Production for the event coverage opportunity. Stay tuned to GOkpop's social media platforms to catch the latest updates!